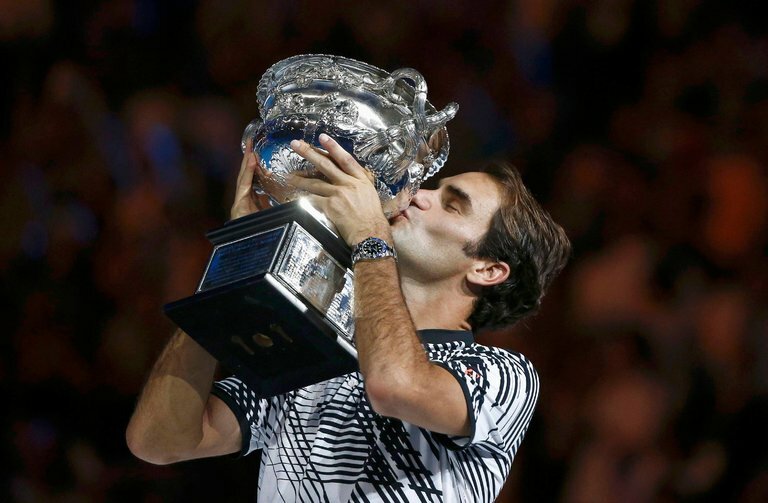 Roger Federer won a five set thriller against arch-nemesis Rafael Nadal to claim his 18th Grand Slam men’s singles title at the Australian Open in Melbourne today. A lot has changed in the world since the last time these two galacticos of the game clashed in a Grand Slam final in the 2011 French Open. But the tennis was a glorious throwback in a three hour and 37 minute encounter on the Rod Laver Arena in which the momentum was changing constantly. Federer was fastest out of the traps as his booming serve powered him through the first set before the Spaniard began to find his range in the second. Two breaks at the start of the third appeared key as the ice cool Swiss powered to a 2-1 lead. At this stage, Nadal appeared fatigued and slightly sluggish in his movement as he no doubt felt the effects of his titanic five hour semi-final victory over Bulgarian Grigor Dmitrov on Friday (January 27). But the 30-year-old then showed why he is considered one of the great fighters in the history of the sport as he came roaring back to win the fourth set and then moved a break ahead in the fifth. Federer, who needed an off-court medical time-out between the fourth and fifth sets, received more treatment to his thigh as he moved 3-1 behind. But he was constantly challenging the Nadal serve and eventually broke back for 3-3 as the quality-levels rose as much as the tension. This proved the pivotal moment as Federer duly broke again in a game featuring a magnificent 26-stroke rally already being mooted as among the best ever. He then survived two break points when serving for the set before sealing a 6-4, 3-6, 6-1, 3-6, 6-3 victory. “Tennis is a tough sport,” said the 35-year-old, who broke down in tears on court after being congratulated by Nadal. “There are no draws – If there were I would have been happy to accept one and share it with Rafa. “Thanks again for everything, to everybody. “I hope to see you next year. It marked only Federer’s third win in nine Grand Slam finals against Nadal and his first since Wimbledon in 2007. The win also secured the Swiss’ first major in four years since Wimbledon 2012 as he stretched his lead in the overall winners list. Nadal remains tied in second place with American Pete Sampras on 14 in his first final since he won the French Open in 2014. “I worked very hard to get where I am,” said Nadal, who, like Federer, has been riddled by injuries in recent years. “I fight a lot, probably Roger deserved it a little bit more than me. “I’m just going to keep trying. Unseeded Australian and Colombia duo Abigail Spears and Juan Sebastian Cabal also claimed a shock mixed doubles victory elsewhere today on the final day of the season opening Grand Slam.